At La Parare, each guest room has a private entrance, a spacious bathroom , a seating area with sofa, a nice fireplace and access to a terrace overlooking the garden. All of our rooms are decorated in a contemporary style, to which we added a number of interesting pieces we picked up during our travels around the world. A La Parare you will enjoy a restful night’s sleep on high quality bedding and linens. For your convenience free Internet WiFi access is available in all rooms. You will also find a hairdryer, radio/CD player, books & magazines, candles, kimonos and possibilities to make tea and coffee. Tower Room at La Parare – at the top! Situated on the top floor of the house, this 32 sqm guest room is very bright and offers a beautiful view over the valley and the olive grove. Curl up in the sofa – in the winter with a nice fire and just relax. Even from the large bathtub you will be able to enjoy the views. It is possible to rent the annex room together with this room (contact us for more information). Info: 32 sqm room with sitting area, bathroom with separate bath and shower, bed 180x200; possibility to have twin beds, ambiance fireplace, Wi-Fi, radio/CD, candles, kimonos, possibility to make tea and coffee. This is a real suite with a separate bed room, with vaulted ceiling which has given the name to this very cosy room. In the salon you will find a large, well-functioning wood fire and plenty of space to relax with your book. A very large bathroom with both shower and bathtub. Info: 40 sqm suite with bed room and salon, bathroom with separate bath and shower, bed 160x200; wood fireplace, Wi-Fi, radio/CD, candles, kimonos, possibility to make tea and coffee. This is a very large, bright and spacious room where the decoration will reflect our time spent in Asia. There is a large sofa (can be turned in to a comfortable bed for a 3: rd. person) in front of the ambiance fire and a staircase leading up to the spacious bathroom. Info: 40 sqm room with sitting area, bathroom with bath and shower, bed 180x200; possibility to have twin beds, ambiance fireplace, Wi-Fi, radio/CD, candles, kimonos, possibility to make tea and coffee. This room offers total privacy, and you even have a little terrace corner outside the room. It’s our most romantic and most original room, designed in different levels and with an open plan bathroom. A nice wood fire – possible to enjoy even from the bath! Info: 27 sqm room with sitting area, open bathroom with bath and shower, bed 180x200; possibility to have twin beds, wood fireplace, Wi-Fi, radio/CD, candles, kimonos, possibility to make tea and coffee. This beautiful vaulted room with a comfy armchairs in front of the big library, has a direct access to the garden with a private terrace and the best view of the sun rise. There is a staircase leading up to the bathroom equipped with a large shower. Info: 45 sqm room with sitting area, private terrace, bathroom with shower, bed 180x200; Wi-Fi, radio/CD, candles, kimonos, possibility to make tea and coffee. 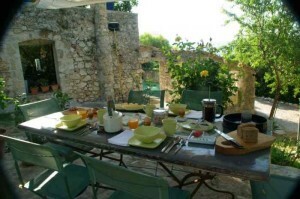 Breakfast is a very important meal, in our opinion, and is served either on one of our terraces under the olive trees when the weather is warm or in front of the fireplace during the cooler days. It is ready starting 8:30 am. No stress you are there to relax! Breakfasts are diverse and plentiful. Most products, such as bread, cakes, muffins, as well as small surprises of the day, are homemade. We serve freshly squeezed juices and fresh fruit, good tea, coffee and hot chocolate, baguettes and fresh pastries, cereals, yoghurt, boiled eggs, cheese and cold cuts. Everyday there is a little surprise for dessert. We make an effort to serve local ingredients whenever possible. If you are gluten or lactose intolerant, let us know in advance and we will do our best to provide you with gluten-free food. If you are lactose intolerant, we can offer you alternatives. Feel free to send us your special requirements.